​I update this page often, so check back to discover new entries. Bar Alfalfa, corner of Alfalfa & Candilejo. I love this one for relaxed breakfasts and afternoon snacks; at night it's jammed to the rafters and deafeningly noisy. This slightly funky, super friendly eatery offers an excellent selection of breads and toppings; they toast it, you fix it the way you like it. I go for avocado on whole wheat saturated with garlic olive oil and dusted with coarse salt and oregano. Yum! Here everything is prepared with artistry, and the menu includes such non-Spanish fare as bagels and eggs, as well as gorgeously presented avocado toast. Outdoor tables in the quiet plaza are a great place for a leisurely mid-morning coffee. 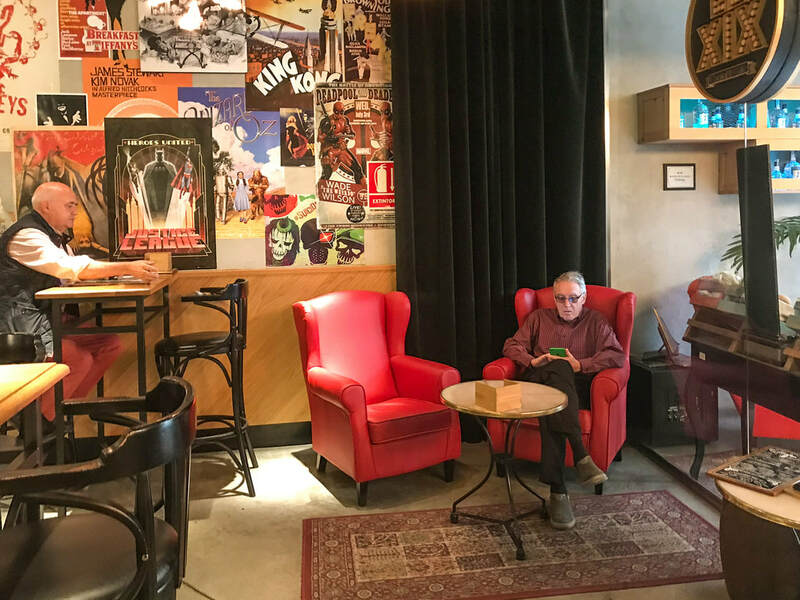 Started by two American sisters, Torch roasts its own beans and makes international favorites such as flat whites and cappuccinos. How trendy is it? The avocado toast is topped with bacon and bean sprouts. Enough said. Artsy types love this mix of bookstore, ceramics studio, gallery, and café. They serve good coffee and sweet cakes if you’re ready for a change from the ubiquitous tostada. But the real attraction is the quirky, entertaining atmosphere. Before you go nuts trying to pronounce it, the name is the Roman numeral 19, or diecinueve (dee-yes-ee-NWAY-veh) in Spanish. At night this offbeat, chic bar is guaranteed to impress a date, but there's no food. I like it best for a great breakfast in a hip yet soothing environment. Bar Castizo is famous for its rice dishes. Bar Castizo, Calle Zaragoza, 6. They define their cuisine as old-school, and many dishes are, but they’re produced with artistic flourishes that demonstrate cutting-edge foodie sensibilities. The setting is charmingly hip. Don’t miss the rest rooms walls covered with domino tiles. ​Café Universal, Blanca de los Rios, 1 (just off Plaza Salvador). ​A great choice in winter, due to excellent heating (a rarity here), this café offers classics with a slight twist. Try the spinach with bacon and walnuts. Eclectic decor and some of the best food in the city is found here; their venison (not normally my favorite dish) is absolutely spectacular. There's a self-operated antique card printing machine to help you remember the address for next time. 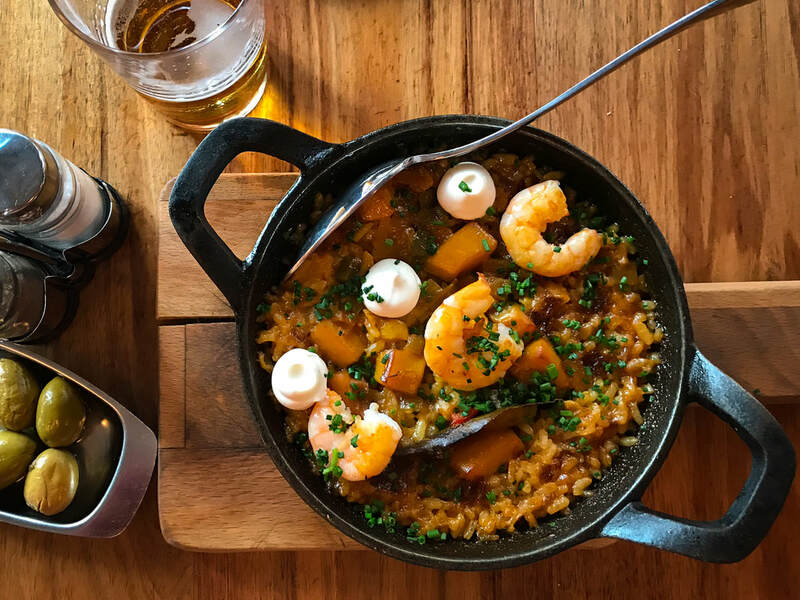 Generally considered the best tapas bar in Seville, this one's so popular you'll have to come early to have any chance of elbowing your way into the crowded bar and back room; avoid the more formal restaurant area, as it's not worth the extra cost. Mamarracha Tapas y Brasas, Hernando Colon, 1 - 3.It describes itself as having urbanite conceptual character. Whatever that is. I like the decor (urban, with a vertical garden) and the food (artichokes to die for, in season). 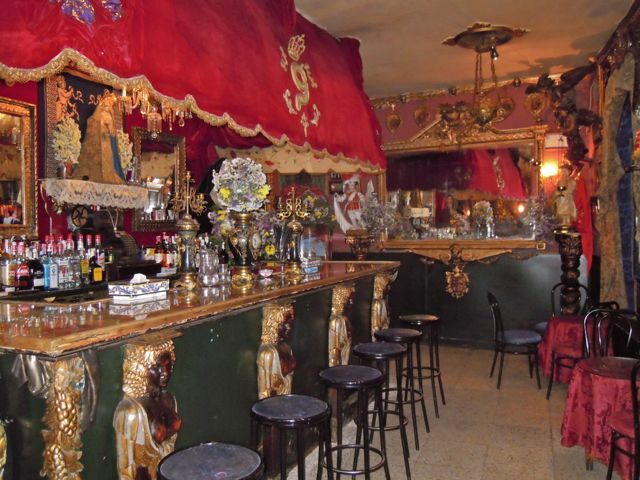 ​Famous for its over-the-top (some say sacrilegious) decor, this bar's signature drink is Sangre de Cristo (blood of Christ) served in a chalice. Diabolical hangover to follow. Before you go nuts trying to pronounce it, the name is the Roman numeral 19, or diecinueve (dee-yes-ee-NWAY-veh) in Spanish. At night this offbeat, chic bar is guaranteed to impress a date, but there's no food; it's more of a cocktail bar. The Second Room, Placentines 19. A nutty mix of plush and funky with fancy late-night drinks; owned by the brothers (one's my neighbor) who run Café L'Art. Rich enjoying a quite moment at XiX.